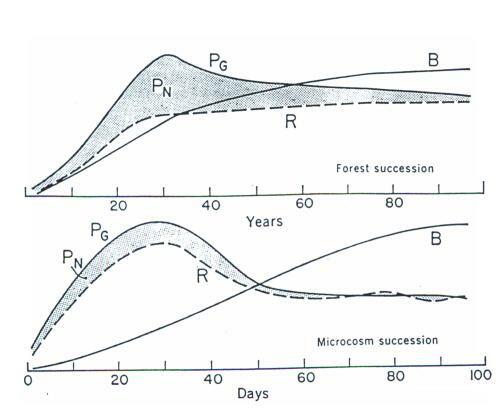 During the first 40 to 60 days in a typical microcosm experiment, daytime net production (P) exceeds nighttime respiration (R), so that biomass (B) accumulates in the system. After an early bloom at about 30 days, both rates decline, and they become approximately equal at 60 to 80 days. The B/P ratio, in terms of grams of carbon supported per gram of daily carbon production, increases from less than 20 to more than 100 as the steady state is reached. Not only are autotrophic and heterotrophic metabolism balanced in the climax, but a large organic structure is supported by small daily production and respiration rates. Figure 1 despicts a basic conflict between the strategies of man and of nature. The bloom-type relationships, as exhibited by the 30-day microcosm or the 30-year forest, illustrate man's present idea of how nature should be directed. For example, the goal of agriculture or intensive forestry, as now generally practiced, is to achieve high rates of production of readily harvestable products with little standing crop left to accumulate on the landscape --in other words, a high P/B efficiency. Nature's strategy, on the other hand, as seen in the outcome of the successional process, is directed towards the reverse efficiency --a high B/P ratio, as is despicted in Figure 1. Man has generally been preocupied with obtaining as much production from the landscape as possible, by developing and maintaining early successional types of ecosystems, usually monocultures. But, of course, man does not live by food and fiber alone; he also needs a balanced CO2-O2 atmosphere, the climate buffer provided by oceans and masses of vegetation, and clean (that is, unproductive) water for cultural and industrial uses. Many essential life-cycle resources, not to mention recreational and esthetic needs, are best provided to man by the less productive landscapes. In other words, the landscape is not just a supply depot but is also the oikos --the home-- in which we must live. Until recently mankind has more or less taken for granted the gas-exchange, water-purification, nutrient-cycling, and other protective functions of self-maintaining ecosystems, chiefly because neither his number nor his environmental manipulations have been great enough to affect regional and global balances. Now, of course, it is painfully evident that such balances are being affected, often detrimentally. The «one problem, one solution approach» is no longer adequate and must be replaced by some form of ecosystem analysis that considers man as a part of, not apart from, the environment. Implementing any kind of compartmentalization plan, of course, would require procedures for zoning the landscape and restricting the use of some land and water areas. While the principle of zoning in cities is universally accepted, the procedures now followed do not work very well because zoning restrictions are too easily overturned by short-term economic and population pressures. Zoning the landscape would require a whole new order of thinking. Greater use of legal measures providing far tax relief, restrictions on use, scenic easements, and public ownership will be required if appreciable land and water areas are to be held in the protective categories. Several states (for example, New Jersey and California), where pollution and population pressure is beginnning to hurt, have made a start in this direction by enacting open space legislation designed to get as much unoccupied land as possible into a protective status so that future uses can be planned on a rational and scientific basis. The United States as a whole is fortunate in that large areas of the country are in national forests, parks, wildlife refuges, and so on. The fact that such areas, as well as the bordering oceans, are not quickly exploitable gives us time for the accelerated ecological study and programming needed to determine what proportions of different types of landscape provide a safe balance between man and nature. The open oceans, for example, should forever be allowed to remain protective territory, if Alfred Redfield's assumptions are correct. Redfield (1958) views the ocean, the major part of the hydrosphere, as the biosphere's governor, which slows down and controls the rate of decompositions and nutrient regeneration, thereby creating and maintaining the highly aerobic terrestrial environment to which the higher forms of life, such as man, are adapted. Eutrophication of the ocean in a last-ditch effort to feed populations of the land could well have an adverse effect on the oxygen reservoir in the atmosphere. Education, as always, must play a role in increasing man's awareness of his dependence on the natural environment. Perhaps we need to start teaching the principles of ecosystem in the third grade. A grammar school primer on man and his environment could logically consist of four chapters, one for each of the four essential kinds of environment, shown diagrammatically in Figure 2.
: For selected general discussion of patterns of species diversity, see Simpson (1949), Williams (1953), Hutchinson (1959), Margalef (1958), MacArthur and MacArthur (1961), Hairston (1959), Patten (1960), Leigh (1965), Pianka (1966) y Pielou (1966a).